Kirk Miller was born in Selma, Alabama in the early ‘50s. He was fortunate to attend and graduate from Troy University, where he worked and studied under famed New York illustrator and portrait painter, Woody Ishmael. Kirk continued his education and attended graduate school at the Instituto de Allende, San Miguel, Mexico. After leaving school, he became a freelance illustrator for advertising and newspaper clients. Kirk worked for and later became the Art Director for a major engraving and wall decor firm in Atlanta, Georgia. In the 70’s, Kirk moved to California where he was offered many teaching, demonstrating and workshop assignments. It was over this period that Kirk wrote two art instruction books for Foster Publications as well as instructional videos on art technique. These in conjunction with portraiture and murals allowed Kirk to truly perfect his skills. Over the years, Kirk has illustrated many magazines, books, videos, cover art, posters, and murals and has had his work syndicated in the newsroom across the United States. His paintings can be found in private, governmental and corporate collections throughout the United States and as far as Korea and Australia. Kirk has lectured at major art schools and Universities and has conducted workshops and demonstrations throughout the United States. 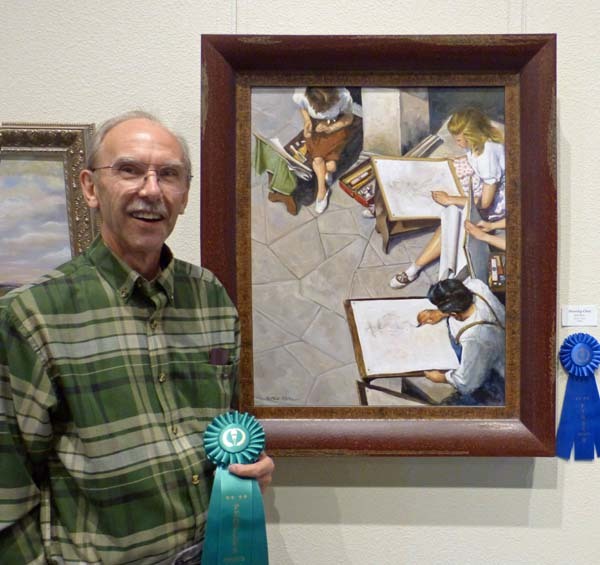 After eighteen years as the owner of the Kirk Miller Art Studio, a teaching studio and gallery in Southern California (Tustin), Kirk moved to Northern California and now lives in Folsom.